A change of scenery isn’t inherently positive. New coaches, systems and linemates are a lot to take in, and sometimes the fit simply isn’t right. Marcus Johansson is lending credence to that notion, as the winger has experienced a rough couple of seasons since arriving in New Jersey. Acquired for second- and third-round picks in July 2017, he was expected to play a larger role than he did in Washington and bolster the team’s offense behind Taylor Hall and Kyle Palmieri. 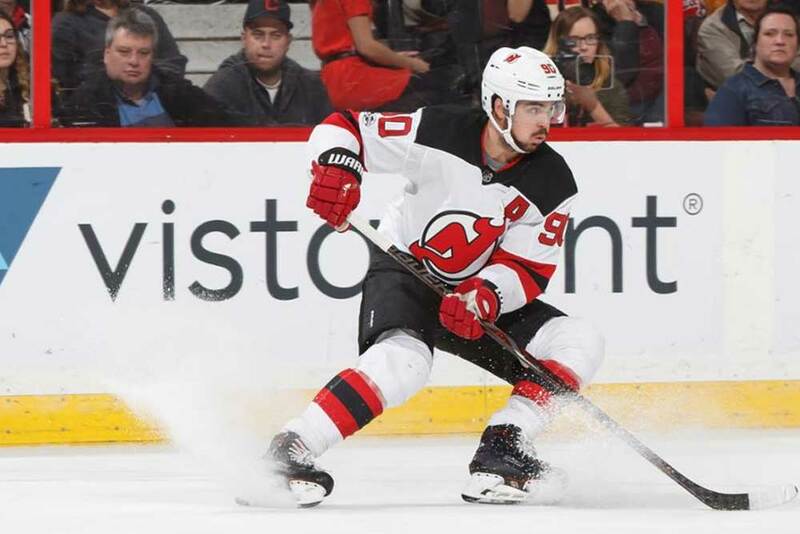 While the raw numbers aren’t necessarily awful (29 points in 60 games in New Jersey), he’s struggled to stay healthy and carve out his identity as a Devil. In order to make an impact, you need to actually appear in the games. Johansson suffered two concussions and an ankle injury in 2017-18, which limited him to just 29 contests. On Dec. 20 of this season, he left the team’s game against the Columbus Blue Jackets with an upper-body injury and has yet to return to the lineup. That’s certainly a string of bad luck. When he has taken the ice, it hasn’t been pretty either. He has 14 points in 29 games this year and his line’s middling production has held the club back offensively (18th in goals per game). Moreover, Johansson isn’t offering much of anything when he doesn’t have the puck. He’s reluctant to battle down low and doesn’t engage in the thick of the action enough to tip the scale in New Jersey’s direction. The Devils owned just 37.5% of the goals scored during his shifts last season, and the story remains largely the same this year with a 37.1 GF%. The 28-year-old fares reasonably well in shot attempts and scoring chances, but over the past two seasons, he’s floundered in goal shares. On a team that ranks 26th in goals against per game and 27th in GF%, Johansson’s deficiencies hurt. The skilled winger posted 58 points and a 64.4 GF% in his final year as a Capital, so there is a precedent for solid play. Therefore, a look at his linemates could answer some questions. His most frequent on-ice partners are Jesper Bratt and Pavel Zacha, two youngsters cut from very different cloths. Bratt (16 points in 28 games) is a 2016 sixth-round pick who has been a pleasant surprise, whereas Zacha (9 points in 37 games) was the sixth overall selection in 2015 and has looked like a bitter disappointment so far. As a trio, they control 51.7% of the shot attempts, 46.1% of the scoring chances and just 36.4% of the goals scored at 5-on-5. Clearly, getting low-quality shots and conceding high-quality ones is not a recipe for success. Zacha is the center and shoulders the heaviest three-zone burden of the three, and he isn’t carrying his weight. Despite a good build (6’3”, 210 lbs) and skill set, he hasn’t adapted to the pro game and just doesn’t govern the play all that well. However, in limited minutes without Johansson, Bratt and Zacha have been much stronger defensively (75.0 GF%). The veteran needs to help his linemates out by digging deeper and making the small, unheralded plays that lay the foundation down for victory. At this stage in his career, though, it’s unclear if he’ll ever change his stripes. He’s a talented yet often disinterested forward who was well insulated in Washington. So how can head coach John Hynes summon the best version of Johansson? That’s the tricky part. Dating back to the start of 2017-18, the winger has only performed well with one center: Nico Hischier (53.2 CF%, 50.0 SCF%, 53.8 GF%). However, New Jersey can’t afford to mess with its top line of Hischier, Hall and Palmieri, as it’s posted a stellar 52.8 CF%, 51.6 SCF% and 66.1 GF% over the past two years. Unfortunately, Johansson doesn’t appear to fit with anyone else. There hasn’t been any chemistry with Zacha or Travis Zajac (46.0 CF%, 47.7 SCF%, 40.0 GF% together since 2017-18). Hynes also seems unwilling to try him down the middle, where he would be closer to the action by default. If he isn’t producing well or keeping opponents off the scoreboard, what is he really accomplishing out there? He’s not a game-breaker, defensive stalwart or high-motor grinder. Just showing up to the rink won’t cut it. He hasn’t demonstrated a willingness to grab the reins and fight through his struggles. Instead, he’s become even less involved. His points/60 rate (from 1.86 to 1.12) and individual points percentage (91.7% to 53.8%) have dropped significantly in 2018-19. There are always factors (linemates, deployment, etc.) to consider with pure production, but when his trio actually does generate offense, he’s no longer contributing to the play. Look, these aren’t your dad’s New Jersey Devils. Goaltending (26th in OISV%) and defense no longer fuel this team’s success. It’s contingent upon the offense to lead the way, and a 16-19-7 record suggests that certain individuals aren’t doing their part. While Hall hasn’t replicated his Hart Trophy campaign from a year ago, he’s still racking up the points (37 in 33 games) and putting a great deal of pressure on the opposition. Hischier (29 points in 38 games) and Palmieri’s (36 points in 42 games) breakout years have flown under the radar. Zajac (24 points in 41 games) and Blake Coleman (21 points in 42 games) are doing their part as diligent two-way forwards. Where is Johansson is all this? If he can find his stride and elevate his line, that would help the team mask some of its three-zone issues. Even if he only has his own interests in mind as a pending unrestricted free agent, his subpar performance won’t help him at the negotiating table. Staying healthy is the first step, but once he returns, he must make his presence felt and show why general manager Ray Shero sought his services to begin with. Otherwise, he may need to pack his bags once again.